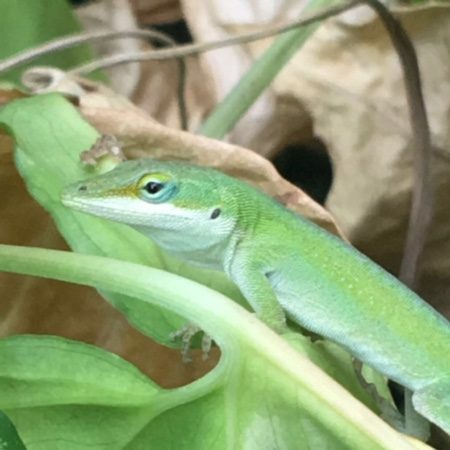 Sometimes referred to as the American chameleon because of its ability to change color from green to brown, the Carolina anole is commonly found on the Field Station throughout the spring, summer and fall. Anoles are medium sized lizards, 12.5–20.3 cm (4.9–8.0 inches) in length. Much of their body length is comprised of tail. Males tend to be larger than females and have a bright red dewlap that is three times the size of the females white one. While often referred to as a chameleon anoles are more closely related to iguanas. Occasionally, about one in every 20,000 individuals, a mutation occurs that reduces or eliminates xanthophores (red pigment containing cells) resulting in a blue or baby-blue individual. Males are highly territorial and will flash their red dewlaps to warn away rival males.